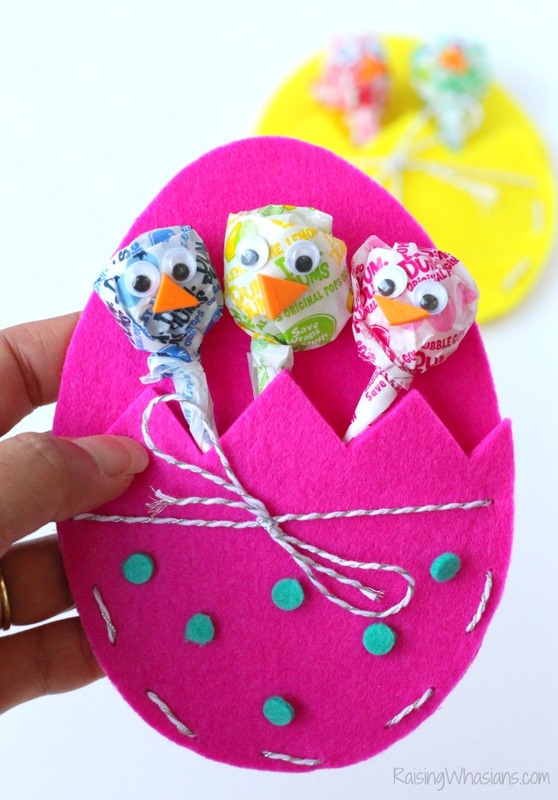 These festive DIY Easter Treat Bags Craft for Kids are the perfect way to send a sweet Easter gift! This post is sponsored by Dum Dums Lollipops. All fun and creative opinions are my own. May contain commissioned links. Reality check, parents. Easter is less than 2 weeks away. The holiday hit me like a freight truck when my oh-so-sweet boy reminded me that the day is soon, really soon. So how are we doing on those Easter goodies? If you’re looking for a great way to spread some Easter treats this season – family, friends, school classmates, etc., I have the DIY Easter Treats Bags for you. 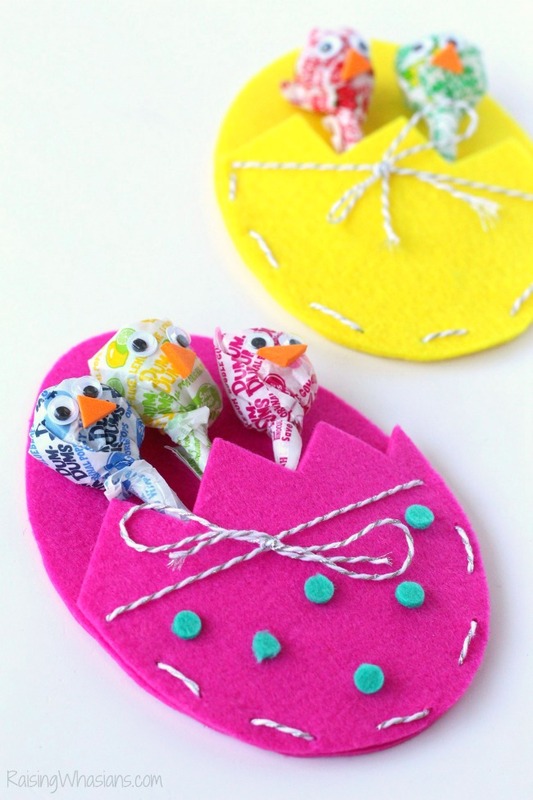 It’s time to jump on the Easter goody bandwagon as we get ready for yet another Easter holiday filled with crafting fun! Sweet, adorable and easy-to-make? Yes, yes we can. 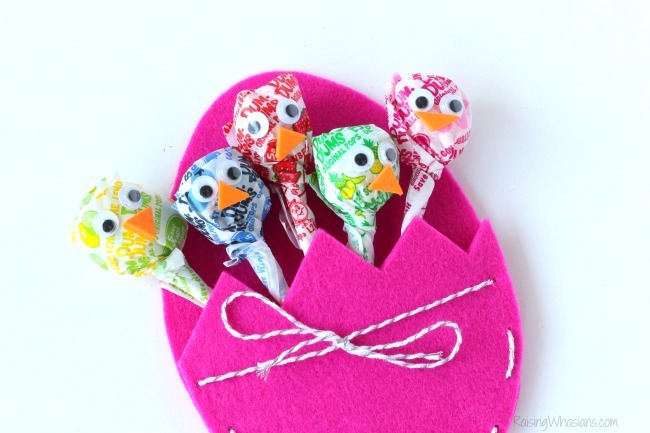 These little Easter Egg Chick Treat Pouches are calling us. has it been over a year since we last crafted with Dum Dums? Our Magic of Spring Garden was such a hit last year, I knew that we had to bring our favorite lollipop back for another spring inspired project. And with Easter so close (yes, thanks again my son for reminding me), it was time to get our materials together for Easter gifts for my son’s school friends. 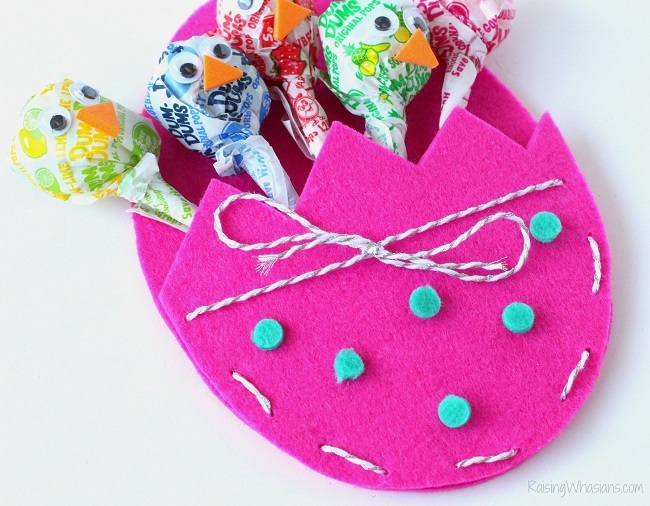 Ready to bring in whimsy and holiday fun into craft time? Grab the kids! 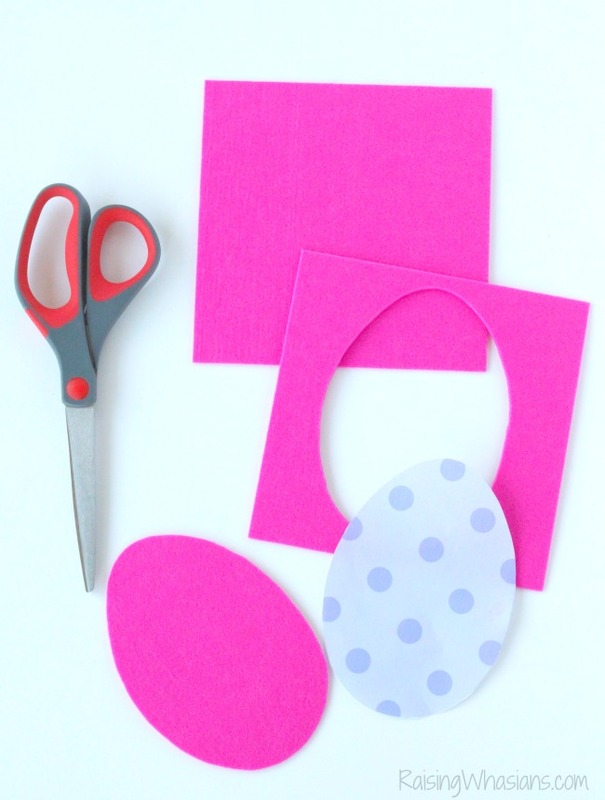 Print out this printable Easter Egg Template. Be sure your printer is set to print to 100% and NOT “Adjust to Fit” so that you print the right size to fit your felt squares. 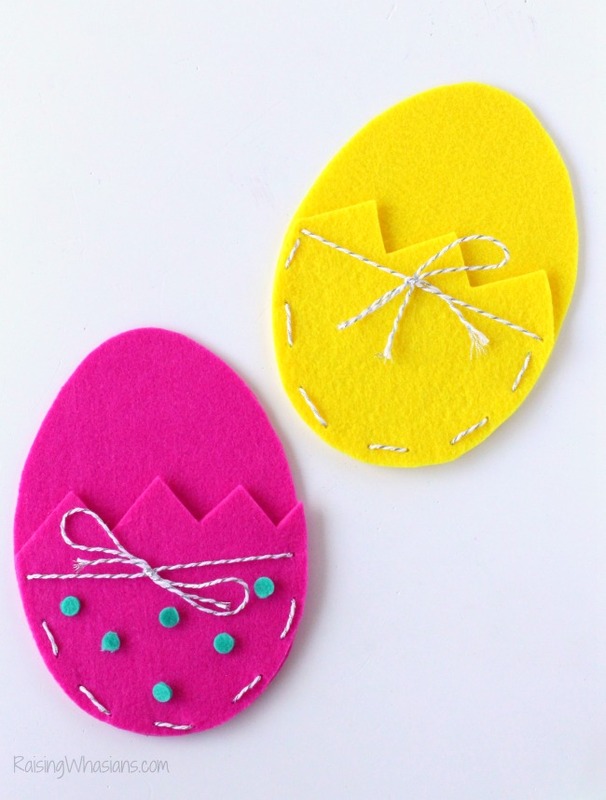 Then take two felt squares and cut out eggs to the size of the template. Choose one egg to be “cracked open.” Cut a zig zag pattern across the egg, about halfway down. 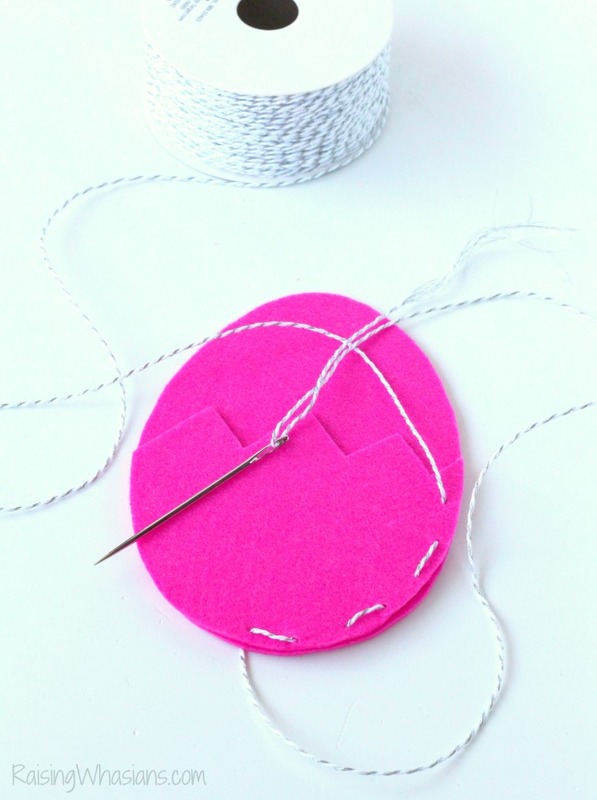 Next grab your twine and yarn needle. Sew the smaller cracked open egg on top of the full size egg. This is going to be your pouch. To get a little fancier, I tied a bow across the middle. Feel free to add decorations – felt patterns, ribbon, paint, etc. to give your eggs character! No egg is complete without little chick friends! So I grabbed Dum Dums lollipops, the perfect treat for tucking inside the eggs. 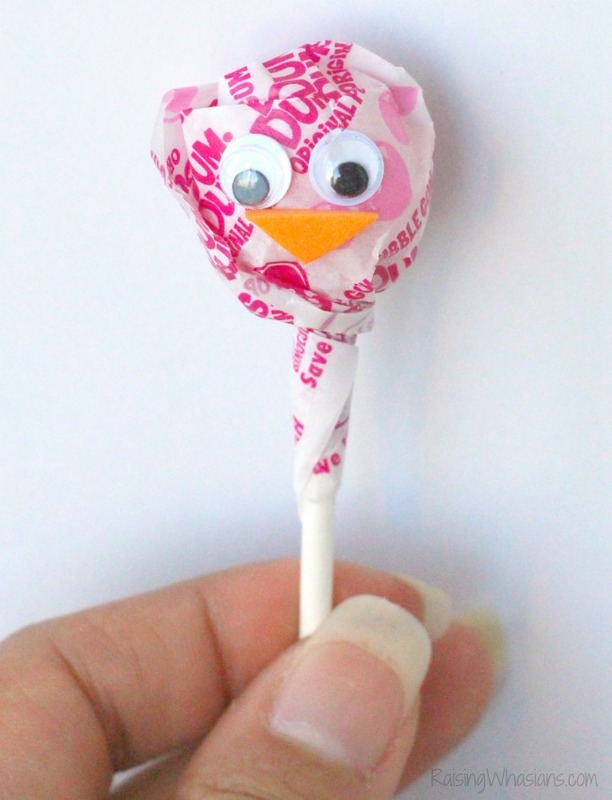 We glued on two googly eyes and a little triangle beak onto each Dum Dums. How cute are these little faces? Then tuck your little chicks inside the eggs. You’re ready for gifting! I have to say that I got a little choked up while making this craft. It was the first time I had pulled out my Grandmother‘s sewing kit in over a year. It’s was great to bring in her passion for sewing into this craft (because if you know me well, you know that I do NOT sew). We couldn’t be happier with the results. 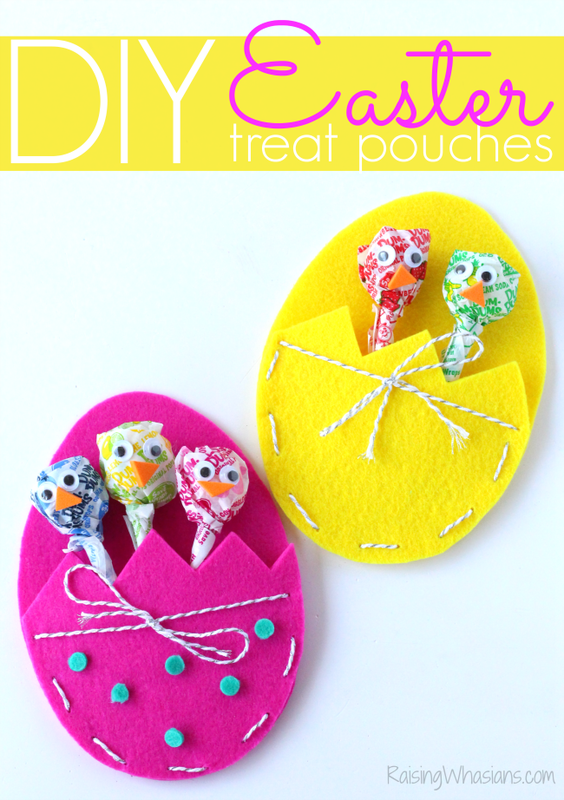 These little DIY Easter Treat Bags are the perfect way to send some love this spring! By creating our own unique pouches and adding a little flair and a special treat, my kids are definitely loving spreading the sweet smiles this season! 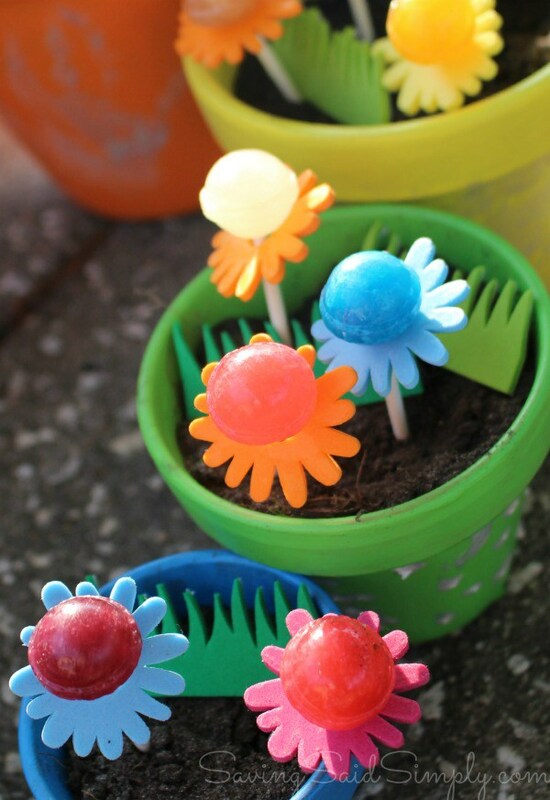 If you’re looking for some more spring inspiration, be sure to check out my sweet DIY Lollipop Garden and these fun Easter craft ideas! Then head over to TheMagicofSpring.com for games, activities and sweets from Dum-Dums and the Spangler Candy Brand! Be sure to follow Dum Dums via Facebook.com/dumdums, Twitter @dum_dums, YouTube, Instagram and Pinterest for great kids projects, new flavors and more! 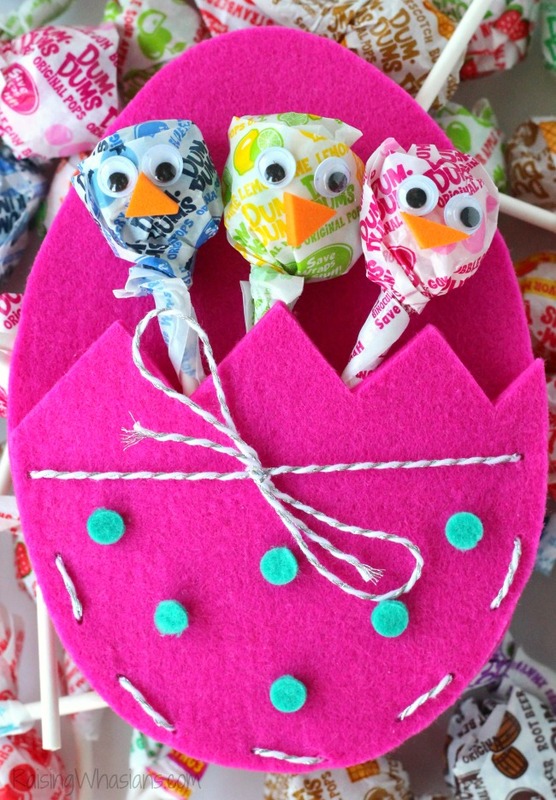 Who would you give these DIY Easter Treat Bags to this season? Be sure to follow Raising Whasians via Facebook, Twitter, Google, Instagram, Pinterest and YouTube for more of our adorable kids craft ideas, family recipes and more! That is such a cute idea. What little one wouldn’t love getting one of those? This is such a cute idea. I love how creative it but still easy enough for me to do! What a cute and creative idea. This will be a great craft project for me to do with my niece and nephew. These are so cute. They are perfect to give out treats to little ones! These are adorable! My kids would love to make these with me! This is such a fun craft idea. Those lollipop faces look so cute. I love how you decorated the eggs. THese are so cute and fun!! can’t wait to make these with my son. I’m going to give these treats to my nephews, nieces and my son too!! Oh my goodness, my kids would go nuts over these! And they seem super easy to make. What a cute little thing to give to my nieces ad nephew. Not a full blow present, but something tasty and fun to look at! We have spring break next week and this would be a great craft to do with the kids when they are home. 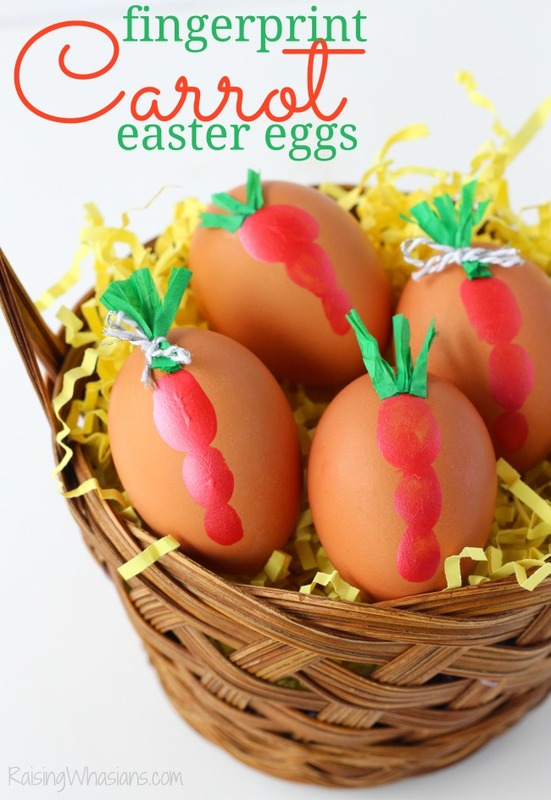 What an adorable craft idea for Easter, they are so tiny and cute. I must make them! 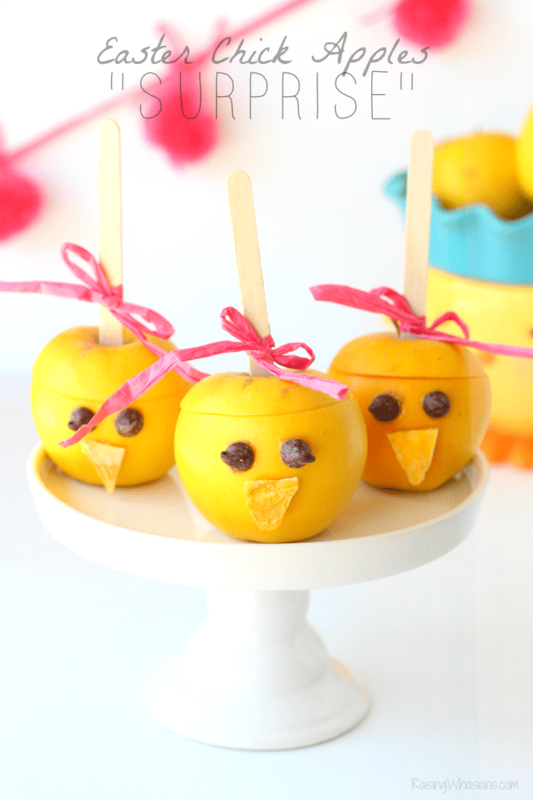 These are so adorable and now I want to make some for all of my nieces and nephews! Oh my goodness. How cute is this? What fun. My kids would love to make these. They’d be great to collect little eggs from our hunt or like you have them with suckers. So cute! What a great project for the kids to work on over Spring Break. They can make one for each of their cousins to hand out on Easter. Adorable and easy! Awwww! Those are just adorable. That would be fun to make and give. These are adorable and even have room for personalization! I have no doubt kids would love these! Another set of adorable crafts from you! These are so happy-making and they seem easy too! Love it. oh what cute projects. My grandkids would really like the lollipop garden. These are super adorable! My kids would love them. 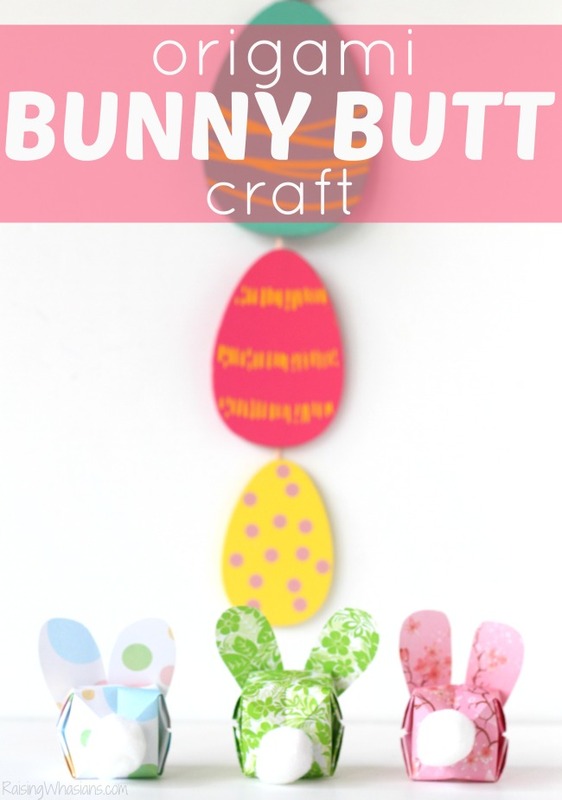 This is the best easy craft I’ve seen for Easter – ever! So darn cute, I can’t stop chuckling, so I can only imagine how much kids would love to make these or even just receive them, esp to give away to their pals! Oh my gosh – that is such a cute idea! Sounds like a fun thing to do for the Easter holiday with kids! That is so cute! I really like your dumdum lollipop chicks.